Eastern senior Sidney Cook connects with a pitch during the Lady Eagles’ season-ending loss on May 17 in Rio Grande, Ohio. Southern senior Paige VanMeter hits a home run during the Lady Tornadoes’ 12-1 victory over Miller on April 6 in Racine, Ohio. A dozen softball players from the Ohio Valley Publishing area were named to the Southeast Ohio Division IV all-district teams for the 2018 season, as voted by the coaches within the southeast district of the Buckeye State. Eastern, Southern and South Gallia each had four selections, with a total of six players returning from last year’s list. 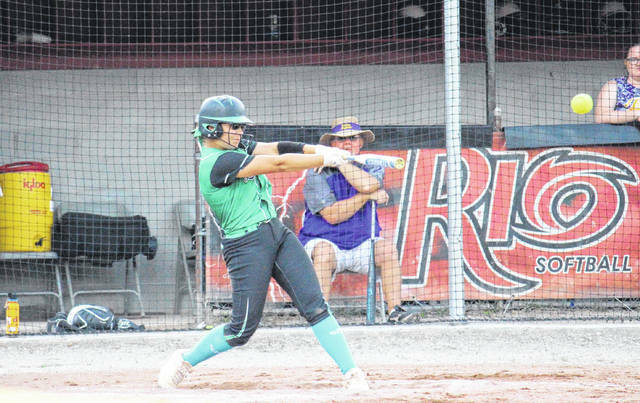 For Eastern, senior shortstop Sidney Cook — a Bowling Green State University signee — was named to the first team for the fourth time in her career. First-time all-district performers for the Lady Eagles include the freshman duo of Tessa Rockhold and Kelsey Roberts on second team, as well as senior Courtney Fitzgerald on honorable mention. Rockhold was Eastern’s pitcher this spring, Roberts stepped in behind the plate, while Fitzgerald patrolled left field. EHS — the Tri-Valley Conference Hocking Division champion — finished the year with a 17-7 record after falling to Valley in a 15-inning district semifinal contest. For the Lady Tornadoes, senior catcher Paige VanMeter — an OU-Chillicothe signee — repeated as a first-team selection after being named second team as a sophomore and honorable mention as a freshman. 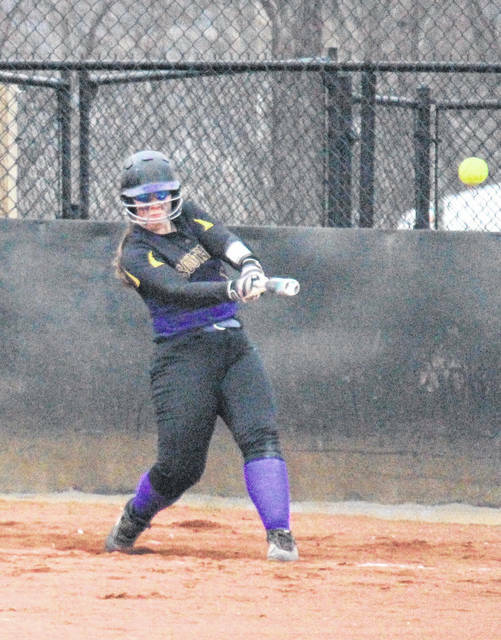 SHS senior Lauren Lavender — an honorable mention last spring — was named to the second team for her efforts in center field. Southern’s senior pitcher Sydney Cleland repeated as an honorable mention, while senior third baseman Jaiden Roberts landed on honorable mention, after being selected to the second team last year. Southern ended the year with a 13-9 record and was ousted from the postseason by Notre Dame, in the district semifinal. South Gallia senior shortstop Olivia Hornsby led the Lady Rebels by being named to the second team. Hornsby wasn’t on the list a year ago, but was an honorable mention in her sophomore campaign. Repeating as a honorable mention for SGHS is Keirsten Howell, a senior third baseman. Joining Howell on honorable mention for the Lady Rebels are freshman center fielder Makayla Waugh and freshman catcher Isabella Cochran. SGHS ended the year with a 6-15 record after falling to South Webster in the opening round of the postseason. Jason Gearhart of Clay was the Division IV Coach of the Year, with Player of the Year honors being shared by Shaelyn Vassar of Clay and Faith Brown of Valley. Shaelyn Vassar, Clay; Faith Brown, Valley; Taylor Webb, Symmes Valley; Katie Osburn, Belpre; Cassie Shaefer, Notre Dame; Denise Young, Waterford; Sidney Cook, Eastern; Madison Pierce, Peebles; Julia Swain, Clay; Sarah Kingery, Symmes Valley; Kyle Tong, Western; Madison Southworth, Pike Eastern; Josie Campbell, Manchester; Paige VanMeter, Southern; Peyton Helphenstine, New Boston; Hailey Moore, Peebles; Gwen Messer, South Webster; Claire Detwiller, Notre Dame. Shaelyn Vassar, Clay; Faith Brown, Valley. Margaret Caldwell, Valley; Hannah Oliver, Clay; Brooke Kennedy, Manchester; Taya Lackey, Trimble; Ava Jenkins, Green; Lauren Lavender, Southern; Kelsey Malone, Ironton St. Joseph; Lea McFadden, Paint Valley; Josie Perani, Miller; Olivia Hornsby, South Gallia; Tessa Rockhold, Eastern; Jensen Warnock, Clay; Taylen Hickman, New Boston; Madison Harman, Belpre; Kelsey Roberts, Eastern; Skylar Moore, Trimble; Emma Baldwin, Waterford; Marissa Neader, Waterford. Savannah Smith, Paint Valley; Keirsten Howell, South Gallia; Makayla Waugh, South Gallia; Isabella Cochran, South Gallia; Jaiden Roberts, Southern; Sydney Cleland, Southern; Aaliyah Smith, Manchester; Katie Sandlin, Manchester; Victoria Fannin, East; Alex Holtzapfel, Ironton St. Joseph; Ashley Bartram, Ironton St. Joseph; Faith Mahlmeister, Ironton St. Joseph; Courtney Fitzgerald, Eastern; Marissa Markins, Valley; Kirbi Summers, Valley; Breanna Carroll, Pike Eastern; Breanna Greene, Pike Eastern; Baylee Cox, South Webster; Kylie Sims, Peebles; Mattie Nichols, Peebles; Lauryn Simmons, Belpre; Hannah McDaniel, Belpre; Jordyn Haggy, Western; Haley Whii, Western; Alyssa Turley, Trimble; Brianna Lunsford, Trimble; Lexus Oiler, New Boston; Molly Hoover, Notre Dame; Isabell Cassidy, Notre Dame; Kerston Sparks, Green; Cass Kellogg, Green; Rachael Cline, Green; Jordan Taylor, Waterford; Kara Saunders, Symmes Valley; Errica Ross, Symmes Valley.